Fast and delicious for breakfast, brunch or lunch, frittatas are easy for holiday house guests. 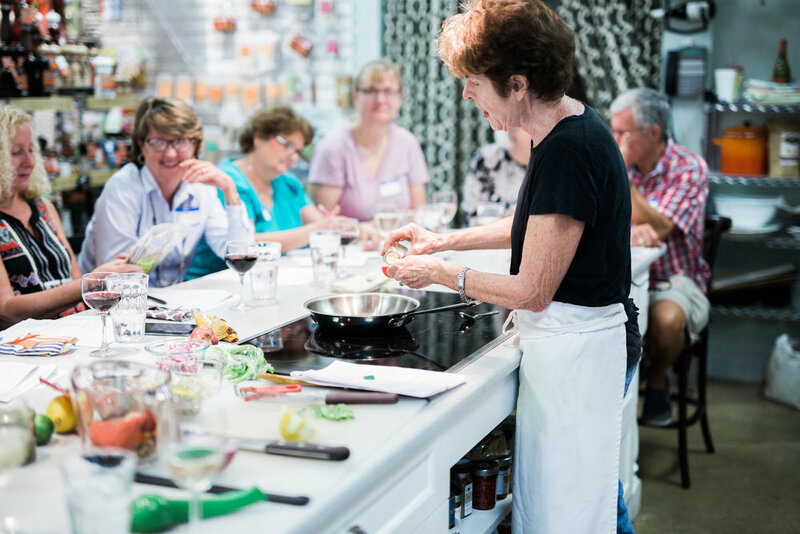 This class will feature several variations with different cheeses and vegetables. Sample each one with a crisp green salad for lunch. Come enjoy the flavors and aromas from the streets of Singapore. Rice noodles with crunchy veggies and curried shrimp skewers doused with tangy peanut sauce. Ignite your taste buds!! Warm up this fall with a soup + sandwich combination that is hearty and soothing. We will make and enjoy potato, kale, & bean soup served with roasted vegetables & ciabatta grilled cheese sandwiches. An Indian staple, samosas are a must have appetizer. Come learn to make this savory pastry filled with potato curry and served with a drizzle of tamarind chutney. Did we mention that it happens to be a vegan delight! Enjoy hot samosas with a cup of creamy cardamom chai in this 1-hour class! Cold gazpacho soup served alongside chorizo stuffed mini sweet peppers, yum yum. Top it off with polvorones de canele or cinnamon cookies. Learn to make these classic Spanish dishes to amaze your family and friends. MAKE YOUR OWN VEGGIE BURGERS! Hasta la vista carne! Today we will be making quinoa and beetroot burgers with avocado and roasted corn salad. Wholesome, healthy and guilt-free, this vegetarian goodness, paired with the lemony avocado salad is a complete meal in itself, with or without the bread. Grilled or pan fried- Delicious and satisfying! You will never think of eggs the same way again! In this 1-hour lunch class, learn how to make a Spanish tortilla (omelette) with the hash brown built right in! Served with pan con tomate and traditional Gazpacho soup so flavorful and light, just perfect for these hot summer days! Learn how to make the famous falafel from scratch, and enjoy it in a pita sandwich with tahini sauce. Accompanied with a refreshing fattoush salad its a dream lunch, light, satisfying and delicious. What to do with all that squash? This 1-hour demo features all things squash, including: Summer Squash Tacos(! ), Gratin with Cheese and Tomatoes, and served with marinated Zucchini and Chick Pea Salad. Yummy & healthy!